Flexible Group management to co-ordindate staff across departments and locations. 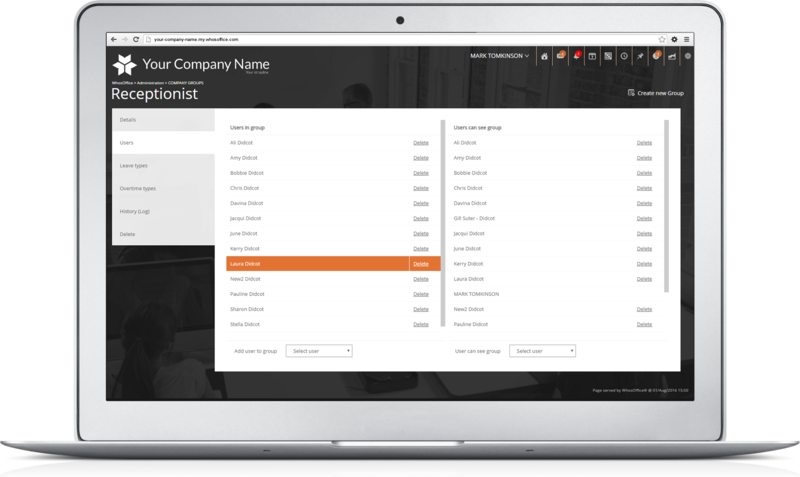 Set up Groups and regions to manage your employees. People can be in multiple groups and this very often reflects the departments within your company, but gives you a much finer control over who can see what. e.g., Managers might not be in a group but they can be set to view it. Leave Types can be assigned to one or more groups and these then become available to staff members within those groups. When you set events to a Region, those events will be available to anyone in that Region. Regions - usually countries - helps you manage your employees in multiple locations around the world. Rules and Restrictions can not only be setup to individual staff but to Groups as well. All the calendars can be viewed by a group, a selection of groups or all groups. You can also distribute work schedules to one or more groups. All reports and exports can be viewed by one or more groups.